We’d love your help. Let us know what’s wrong with this preview of The Lonely Balloon by Gemma Mallorey. The balloon soars high in the sky. Large, beautiful and rather lonely. He tries hard to make friends but, being so high up, he appears aloof and distant. Something has got to give, and in a little time it does! To ask other readers questions about The Lonely Balloon, please sign up. The Lonely Balloon is a super cute, children's novel with absolutely fantastic pictures! This book doesn't have a rhyming scheme, which was a nice change. The lack of forced rhyme made me appreciate this book more so than I expected too! The book follows a beautiful, green balloon as it soars up high! The balloon meets birds and flags as he makes his way up to the sky - but he is oh so lonely! He was super happy when he played with children, and lucky him that a child was carrying him around! 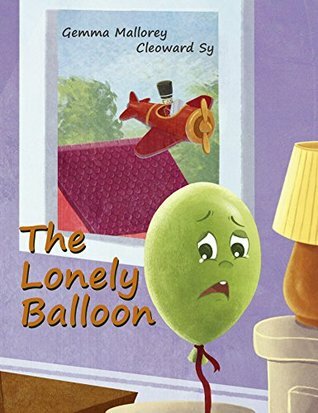 Th The Lonely Balloon is a super cute, children's novel with absolutely fantastic pictures! The book follows a beautiful, green balloon as it soars up high! The balloon meets birds and flags as he makes his way up to the sky - but he is oh so lonely! He was super happy when he played with children, and lucky him that a child was carrying him around! The balloon begins to make new friends in the child's bedroom as he slowly deflates. The theme of this story is a strong, well thought out one - even if you don't see yourself as "beautiful" or "perfect", it doesn't matter! You can still not be at your best and be friends with other people! Those friends will love you despite your flaws. I did really like the illustration style. It was similar to water colour, but with sharp corners for the buildings. It was simple on the eyes! The simplicity was just beautiful, since it didn't try to overdo itself with crazy, in-depth pictures yet it was so elegant with it's style and colours at the same time. I really enjoyed this short story! I'd highly recommend it for it's beautiful theme and fantastic artwork. It's an excellent children's read, perhaps for bedtime? Either way, it's a must read picture book from this reviewer! Such a sweet, short tale! Beautiful illustrations. Well written. The pop up text was a nice addition. Great for those with small children. This is a story about a balloon who is lonely and wants a friend. He finally fines some just as he is deflating. The pictures were fine although it doesn't fit into what I would read to my children. This shows that no matter what you are, we could always use some kind of friend to be with too! The book was colorful and bright but it lost its continuity at times and just didn’t make sense. The balloon wants to make friends. A simple story for toddler/preschool kids. I felt so sad for this little green balloon. After he is rushed around town by his child owner, he is abandoned in a bedroom. He must be patient to find what he’s looking for – friends. I have a similar theme in my picture book Tess the Princess Dress, but my Tess is not lonely from the start. The illustrations by Cleoward Sy fit the picture book style and I like balloon’s expressions. I think this book ended too soon. What will his new friends do when, A simple story for toddler/preschool kids. I felt so sad for this little green balloon. After he is rushed around town by his child owner, he is abandoned in a bedroom. He must be patient to find what he’s looking for – friends. I have a similar theme in my picture book Tess the Princess Dress, but my Tess is not lonely from the start. The illustrations by Cleoward Sy fit the picture book style and I like balloon’s expressions. I think this book ended too soon. What will his new friends do when, the next day, the balloon’s helium is all gone? I also want the balloon to take charge of his own destiny! The balloon's perspective is a nice story, but the story ended a little abruptly. For young children, it definitely helps with showing them how to make friends and like themselves. Loved this..Feel good factor.There's a time and a place for us all.Story with a moral and a purpose.Recommend to all. A wonderful story to teach children about friendship and how all of us need to be aware of others. The Lonely Balloon is a lovely book about making friends with beautiful illustrations. The story makes a terrific bedtime story. Great read for my third grader ! Very good book about making friends. My soon to be fourth grader enjoyed reading this story as she well soon be starting a new school.